One of the common themes among many of the women I work with is over- eating when they’re on their own at night. Whether they’re single and spend many evenings alone, or they’re married but their husbands are out or away, these nights alone can lead to bowls of ice cream and bags of Doritos FAST. In the past, this time of day used to be a huge downfall for me as well. I’d be so good during the day – at work, staying busy – I’d come home with the best intentions of making a healthy dinner and having a calm night in, but then after said dinner, the after-dinner-munchies would weezle their way in. Next thing I knew, I was on my 5th snack of the evening and still not satisfied. 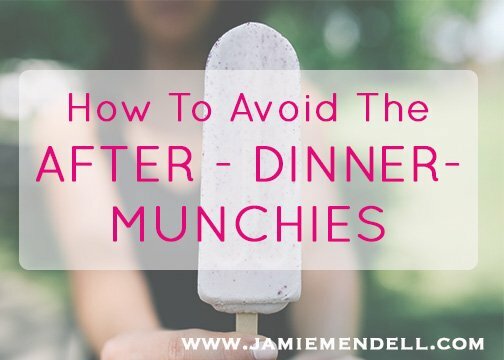 Are you familiar with the after-dinner-munchies? They used to come to help me relax. They helped me feel less lonely and kept me company. They gave me something to do because I was alone at night and didn’t know what else to do to. So I set out to fix this problem many years ago. Although I was thankful to those after-dinner-munchies for keeping me company, I knew they were not good for my physical health and they were preventing me from actually dealing with whatever real life emotions came up. What I realized is that I never really learned how to enjoy time on my own. Time on my own at that point meant watching crappy TV that I really got no enjoyment from or going to the gym to burn calories (which I also got no enjoyment from). It’s no wonder that night after night I was so freakin’ bored so I just turned to food to help me out. And now, I love my time alone. I no longer fear that time alone = 6 bowls of cereal and eating all the leftovers in my fridge. 1. Don’t spend as much time alone. So here is what happens. At some point in our past we decided that we needed to lose weight, so we started dieting. And when we started dieting, we began pulling back from social activities because we try to “control” as much as possible in our lives. We try to control our food intake, so why would we want to go out to eat? We think we need to eat less calories, so why would we indulge Happy Hour with our friends? We need to hit the gym every night, so there is clearly no time to try out that art class on Wednesday nights. We start controlling our lives and they become dull and boring and we claim that we need a lot of “me time”. Here’s what I have to say to that: you don’t need as much “me” time as you think. I promise. As an introvert, I would know. Connection is good for you, it’s most likely a HUGE part of what you are craving and what you are turning to food for. Try making more plans instead of less plans; see more friends instead of less friends; have more spontaneous nights out instead of less. 2. For nights you are going to be alone, plan it out! If you were hanging out with a friend, most likely you would make a plan for what you were going to do that night right? Do this with yourself too — treat yourself like your own BFF that you’re going to hang out with. What shall we do tonight, BFF? Make a plan for how the night will go so that you don’t end up watching crappy TV with a big bowl of pasta in front of you. You should ALWAYS be excited about the time you’re going to be spending with yourself, so choose activities that you truly enjoy (see #3). 3. Here are potential activities: And now for my laundry list of potential things to do with yourself. Disclaimer: the most important thing here is to know yourself. These ideas aren’t for everyone, they are just meant to be ideas. Test some out and learn what truly lights you up. Go to a bookstore and browse the books. Get a cup of tea and sit with a book for a while. Enjoy the atmosphere. Plan to have a phone date with an out of town friend. Don’t have an agenda for the conversation, just let it linger. Get Netflix and set up your queue to keep delivering awesome movies to you. This is great because you can plan when you’ll be getting the movies. Clean the kitchen after dinner, cozy up with a blanket and a hot beverage, light some candles, and get sucked in. Do research on something that’s going to be really fun for you. For instance, I love travel and planning, so I could spend hours researching upcoming trips. I’ll look at attractions, delicious restaurants I want to try, etc. Go to a movie on your own. Hey, it gets you out of the house and out of your own kitchen! Go to a nearby cafe and get a delicious drink. Write, read, or just people watch. Go for a walk and listen to a new playlist. Start a creative project. I always try to get my clients to explore a creative outlet because I believe we ALL need this to feel fulfilled. Start a blog, scrapbook, find a craft from Pinterest, or even cook something. Get started on a new TV series that you truly enjoy. I could sit and watch Downton Abbey for hours and hours — find a show that you love and have a “that show” Marathon. Stay connected. When I used to travel for work, I was alone ALL. THE. TIME. I used to binge constantly, until I started staying connected to people even when I was on my own. I started texting my friends throughout the day, calling friends and family at night, emailing about upcoming plans and ideas, etc. Stay connected even when you’re on your own — it feels so comforting. Buy or create something for someone else. Sometimes when I’m bored I think about whose birthdays are upcoming. I love shopping for gifts, so I’ll use my downtime to pick out the perfect gift, get it all wrapped, etc. It makes me feel excited and organized… win, win. Plan for the future. I know a lot of us are big planners, yet we are so busy planning out our calorie allotment, that we forget to plan out our fun allotment. When I have a night to myself, I’ll sit down with my calendar and think “ok how can I make the next two weeks the best possible”. I’ll email friends about potential plans, book hair appointments, schedule lunch dates with colleagues, and figure out how to make my work schedule the most enjoyable. I feel satisfied, excited and accomplished when I can look at my calendar and be truly looking forward to the upcoming weeks. Read a really good book — not one that you are TRYING to get through, but one that really grabs you. Sit and listen to music. This is one of the methods I used to try to really “be present” with myself at first. I would put on (ok, emotional) music and just lay on my bed sometimes. It let me slow down, connect to myself and process life and everything that was going on. I highly suggest doing this at least for 15 minutes just to settle down and feel connected to yourself. Dance. Feeling funky? Put on some tunes and dance. I guarantee you’ll feel different after just two songs and will have new ideas for what to do after. TRUST in the Universe that the boredom / loneliness will pass. I used to eat all the time when I was bored or lonely. When I wanted to stop doing that, I kept telling myself “I know you’re bored now. Trust that something will happen soon that will entertain you.” And I would just wait it out and sit with the bored feelings. Sure enough, after a few minutes, someone would text me and start a conversation, an idea of what to do would come to me, or something would happen in front of me that broke up the boredom. Have a little trust in the good ol’ Universe. I’d love to hear in the comments below… do you struggle with being on your own? If so, what are you going to start doing to enjoy that time more? Do you have any other ideas to add to this list? P.S. Want more of this? 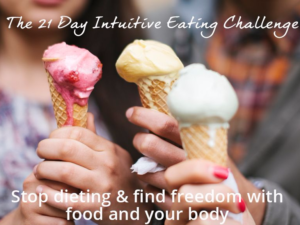 Thousands of women have gone through the Intuitive Eating Challenge and have completely transformed their relationship with food. If you’re constantly thinking about food, obsessing over it, and stressing about it, this program is for you. You’ll learn how to get out of the diet mentality and move toward a free, easy, “normal” relationship with food. You can sign up anytime. Click here to learn more. I love this post! This is exactly my problem – what I do when I’m alone at night is VERY different than what I do when I’m busy during the day. My problem, too, though, is that I’ve sort of programmed myself to eat when I’m watching television. So, even if it’s one of my favorite shows – much like when I’m at the movies and “have” to get popcorn and a drink – I’ve programmed myself to believe that watching something isn’t complete without food. Any tips? I like the warm beverage idea, because coffee/tea/hot cocoa are my go-tos when I don’t want to eat something but I need comfort, but anything else? Teresa, sounds like its just a habit. Try starting with having a cup of hot tea — that’s what I do. It’s soothing and it lasts a while. After trying that out a few times, try transitioning to not having anything while watching TV. Another thing to think about, do you just need to be doing SOMETHING and that’s why you eat? If that’s the case, maybe during commercials you can work on something else, text with a friend, or browse the internet to keep yourself occupied and entertained. Let me know what you think! Thank you for this article. This is the number one problem for me! I will try to use your tips. You’re so welcome! Let me know how it goes. Jamie this is when I do the majority of my eating!!! I get a lot of work done at night and I always want something sweet o end the day and – any recommendations ? Love this! This has definitely been a struggle for me. For me, it was about figuring out WHY I was uncomfortable being alone. So often, we throw ourselves into other tasks to take our minds off of our boredom, which is really an inability to be with ourselves. Once I got past those “inner demons”, being on my own actually became much more enjoyable, even WITHOUT something to do! ultimate tips, thank you for sharing the interesting tips , well done , keep it up.